Do you provide supervision? Or receive supervision from others? Supervision plays a pivotal role in the professional development of social workers, psychologists, counsellors, managers, health practitioners, life coaches and other human service professionals. At its best, supervision can be a powerful crucible of discovery and learning for both supervisor and practitioner—with the benefits also flowing on to clients. A Vision for Supervision is a new way of encapsulating ‘good practice’ in human services work. 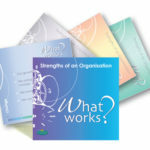 Blending ideas from the complementary worlds of solution-focused and strengths-based practice, this unique resource invites both supervisors and practitioners to stretch their reflection and conversation. Each card explores a different topic, such as ‘Hopes and plans’, ‘Present situation’, ‘What worked?’ and ‘Noticing success’. Together, the 40 cards provide 160 strengths-based, reflective questions for building your supervision conversations from start to finish. Use these cards to explore expectations of supervision, roles and responsibilities, or to introduce a touch of novelty into an existing supervisory relationship. A Vision for Supervision is ideal for supervisors and practitioners to use for reflection between supervision sessions, or as a reminder of the salient themes to explore during supervision sessions. To purchase this product (operating through Campion My Connect) click on the Campion Bookshop button (at the top of this page under the price). This will take you to the Campion bookshop. After purchase, download the Campion App and A Vision for Supervision will appear in your library. Here is some more information to guide you. A Vision for Supervison boxed card set and booklet also available. 40 double sided cards complete with digital booklet.